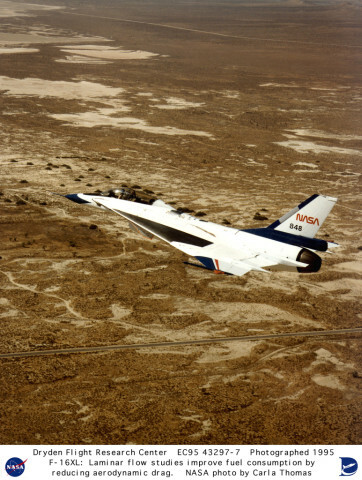 Description: A laminar flow control experiment covering much of the left wing (dark area) of NASA's F-16XL “848” is seen clearly as the aircraft cruises over desert area near NASA's Dryden Flight Research Center, Edwards, California, on a functional check flight Oct. 13, 1995. The flight marked the beginning of an important program of 45 flights to see if the experimental wing panel could achieve laminar (smooth) air flow over the wing's surface at supersonic speeds. Researchers say that successful laminar flow on an aircraft the size of a future supersonic jetliner could help reduce gross takeoff weight by as much as 10 percent, leading to increased efficiency and lower operating costs. The laminar flow experiment on the delta-wing F-16XL features an internal suction system that pulls a small part of the boundary layer of air above the wing through millions of tiny laser-cut holes in the outer skin of the experiment, creating laminar flow. The research program is managed by NASA's Langley Research Center, Hampton, Va., and involves an aerospace industry team that includes Boeing, Rockwell, and McDonnell Douglas.